The kitchen is one of the most used rooms in any home, it’s a place where meals are cooked, conversations are started, entertaining is done… it’s the heart of a home. It needs to work for every member of your family and often requires a table or breakfast bar so that people don’t always need to eat in a formal dining room. Whether you own a period property, a new build or something in between, you’ll want your kitchen to be impressive. You won’t want a kitchen that’s run-of-the-mill, identical to thousands of kitchens up and down the country. You’ll want something bespoke, a kitchen that’s been lovingly handcrafted to your exact specification. A kitchen that deserves to be adored. We are the bespoke furniture experts. We have decades of cabinet making experience and we can design something that’s better than you ever dreamed possible. We love pushing design boundaries and offer the finest cabinets and upholstered items. 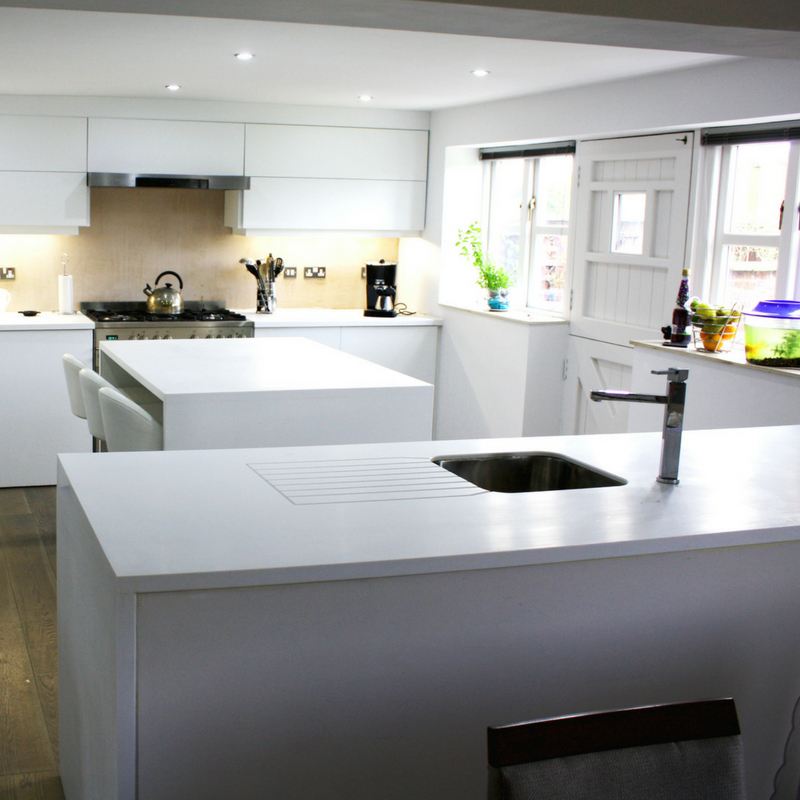 One of our favourite bespoke kitchen projects to date was for a home in Lymm. We really got to know the homeowner, their preferred interior styles and how they wanted to use their kitchen before suggesting how we could combine materials and gave them a kitchen that wowed. They loved our ideas and were delighted with the finished one-of-a-kind kitchen. We fabricated a material called ‘Avonite’, a solid surface product to produce the kitchen worktops and island. They are so stunning and make the room seem much bigger and lighter than it did beforehand. The stools underneath the island are modern and stylish, complimenting the island. We handcrafted the cabinet carcasses in melamine faced MDF before spray painting the doors. The finish is perfect and the kitchen is now the best room in the home. It’s worthy of appearing on the front cover of any home interior magazine. If you want a kitchen to be proud of, get in touch with us by ringing us on 01925 419121 or filling in our contact form.